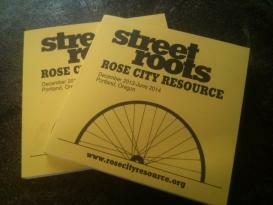 When in stock, hardcopies of the Rose City Resource can be picked up at Street Roots, 211 NW Davis St, Portland OR 97209 during office hours (7:30-3 M-F; 7:30-2 Sat; 7:30-11 Sun). Please call Street Roots at 503-228-5657 to check availability. Hardcopy guides are available at the Street Roots office at 211 NW Davis St in Old Town Portland, or from your friendly neighborhood Street Roots vendor. Help us continue to serve the community by donating to the Rose City Resource via a secure link through our friends at Democracy in Action. All information is updated regularly by Street Roots and is based on the best information available at the time; however, things do change and we can't guarantee that there won't be errors. To make updates, requests, or report changes or inaccuracies, contact the Rose City Resource by clicking here or call us at Street Roots: 503-228-5657. Link to us! Embed a link like the one below in your own site. Click here for HTML code.